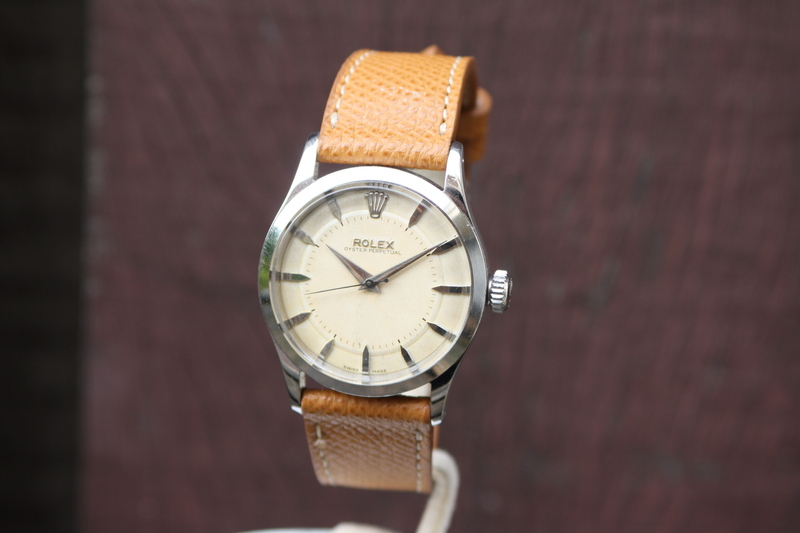 Rolex 6332 oyster perpetual automatic watch with a 34mm waterproof case. 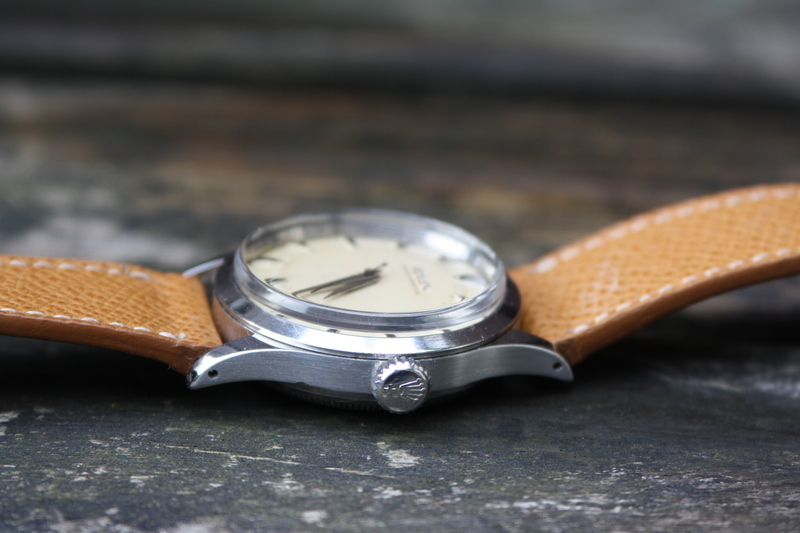 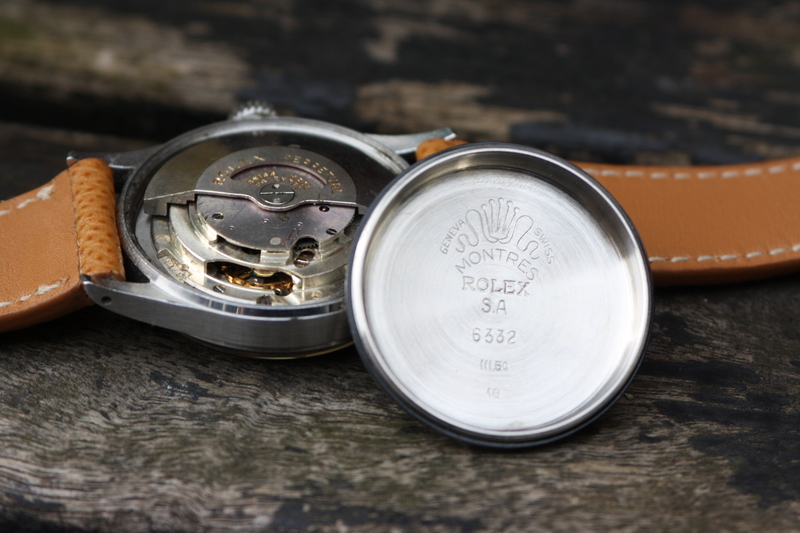 The rolex reference 6332 has a unique and unusual oyster case with polished lugs and flat brushed sides. 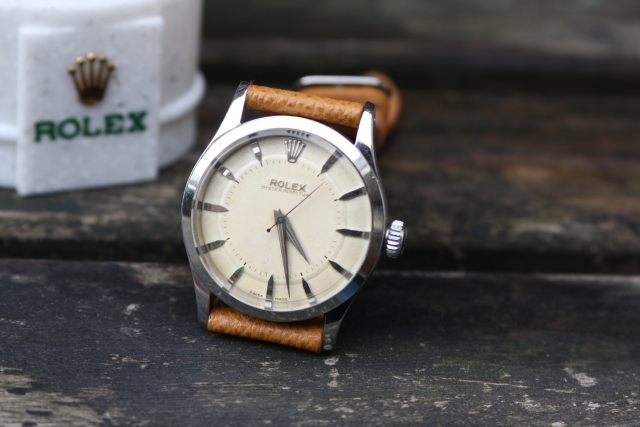 Some of these early Rolex 6332 watches have a ‘Deep Sea’ signature on the dial, probably because of the extreme good waterproof capabilities the watch has for it’s period of time. 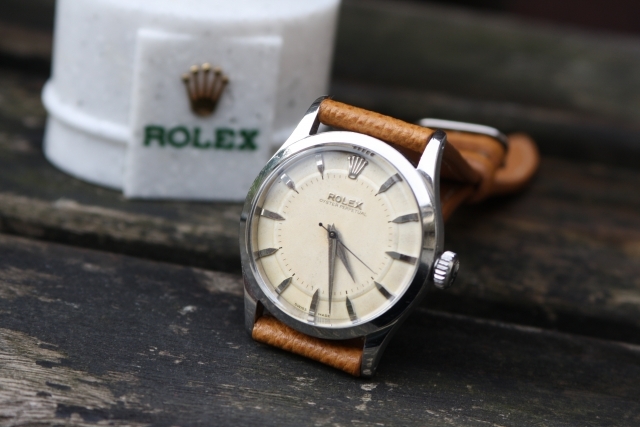 The first Rolex submariner watches went into production around the same time in 1953. This oyster perpetual Rolex 6332 could be considered as very rare as it has only been produced for a few years and the condition is fully original. 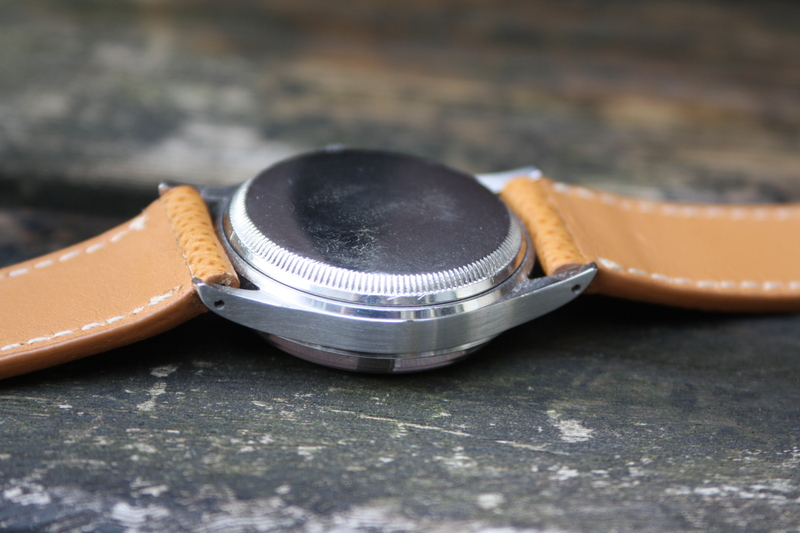 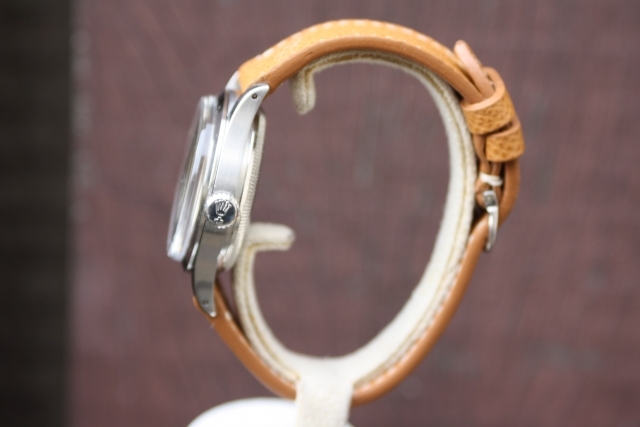 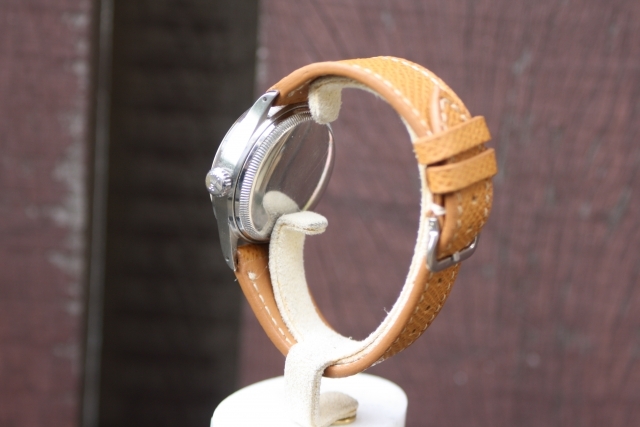 The case of the watch measures a gentle 34mm without the crown. 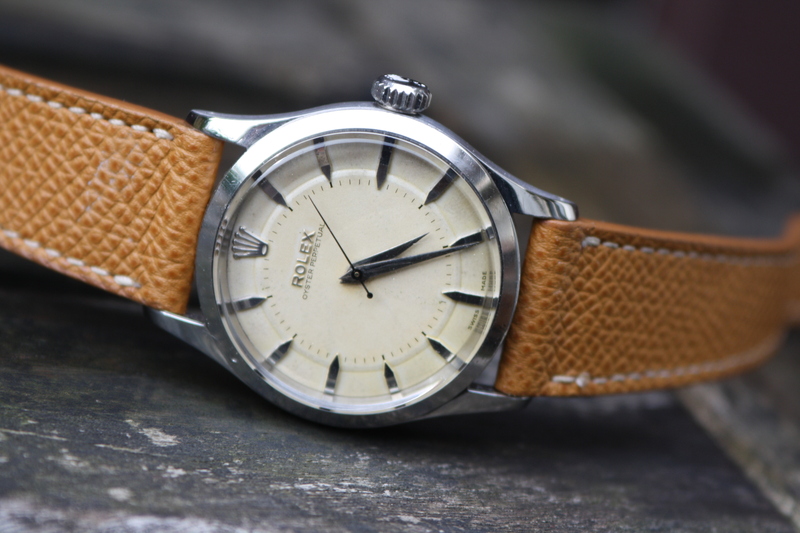 This early Rolex has a so called ‘Brevet’ case . 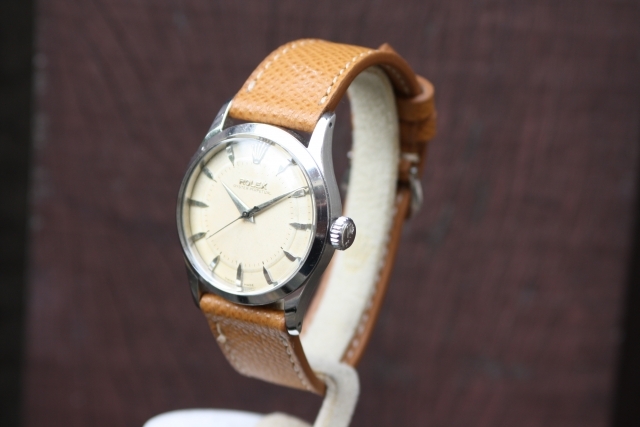 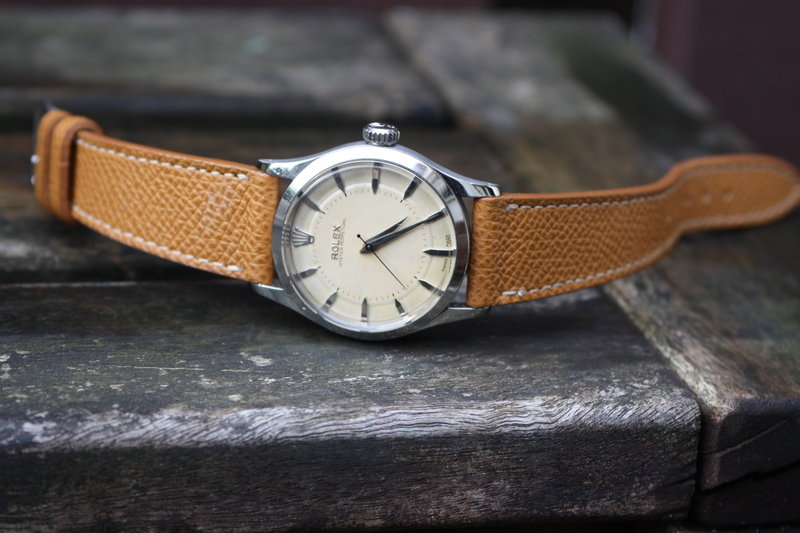 The condition is very good and the watch is still bearing the original Brevet crown. The condition of this early automatic Rolex watch is very good and most importantly fully original. 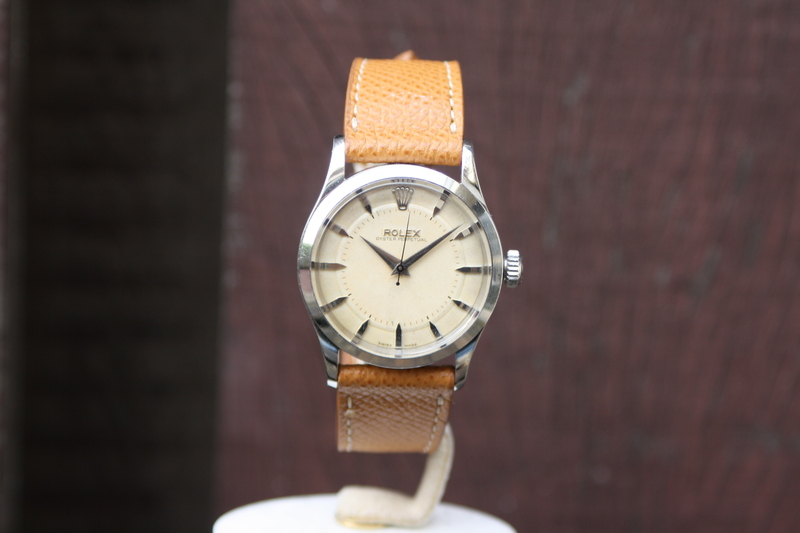 The case is polished before but remains in decent shape, case and serial numbers are clearly visible and dating back to 1954. 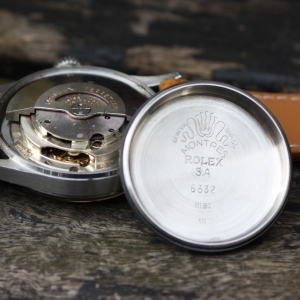 Inside is running an early oyster perpetual a260 caliber, this movement is also used for many bubbleback references. This early watch has a stepped dial without lume on the hands and dial. 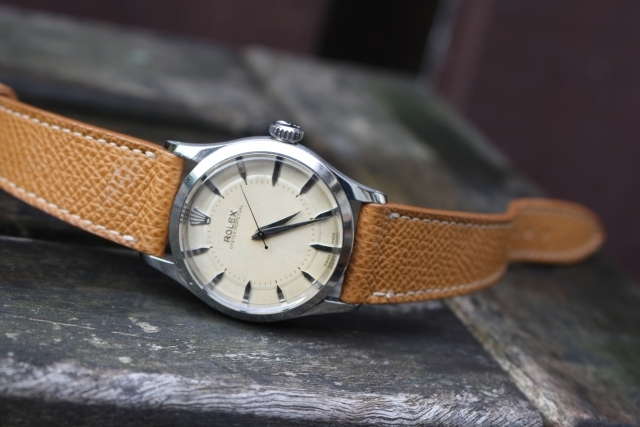 Collectors often call this a ‘No lume’ dial and some say most of these particular watches have been sold in Japan due to government regulations against radium and other luminous material used by watch manufactures in the 1950’s. 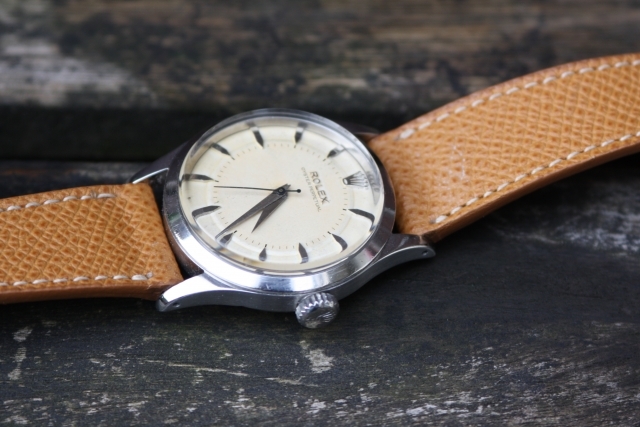 The absence of radium makes it safe for daily wearing compared to watches from the same era containing radium which caused dials to change dramatically after time. Of course heavy patina has it’s charme as seen on this Rolex 6536-1 Submariner watch from the 1950’s. 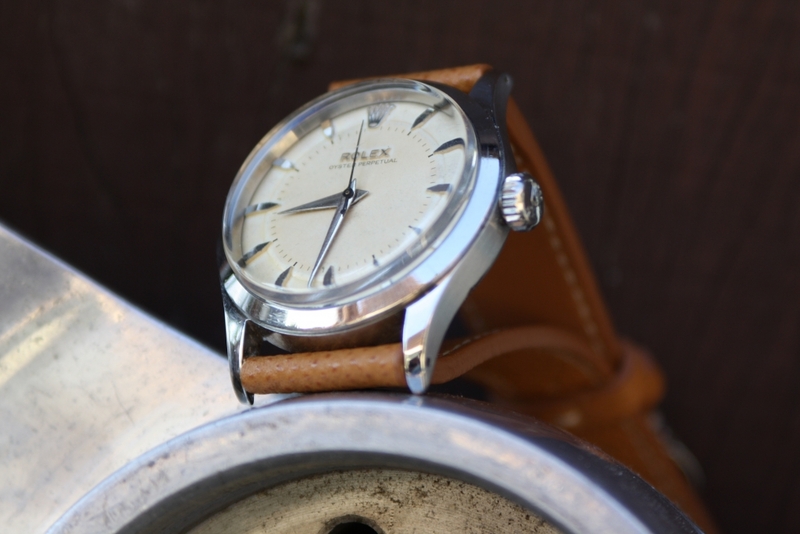 For daily wearing we advise watches with tritium or no lume as the Rolex 6332 we offer here. 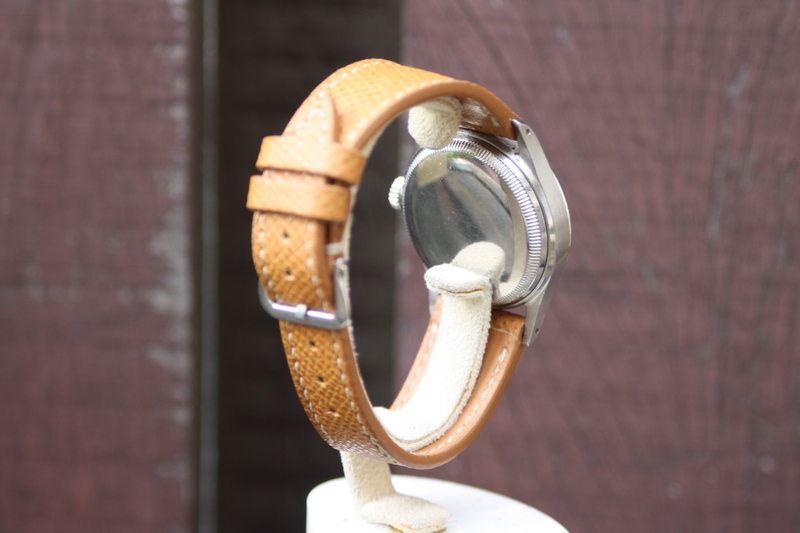 Please contact us for more information or any questions about the watch. 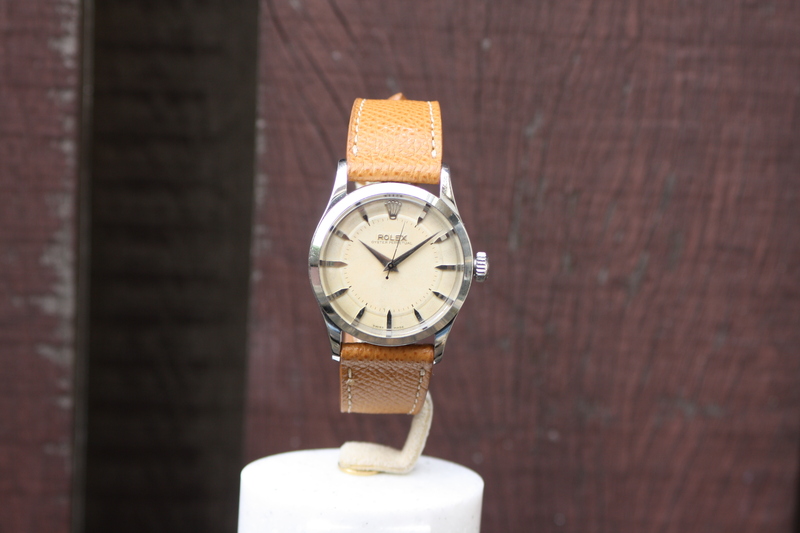 We ship worldwide and also trade in your vintage timepiece.